Ross Castle is a fascinating late medieval palace which is situated in the heart of the Irish National Park Killarney. The landscapes of this natural site are amazingly beautiful, of valleys with incredible mountain heights which occupies the greater part of the Killarney. The beautiful picture with numerous lakes is able to hold the breath of anyone who decides to visit this part of Ireland. Ross Castle is located only 10 minutes walk from the center of the Killarney and to walk around it is a delight for all senses. The ancient palace with the background of numerous lakes in the region is a magic picture. Nearby there is even a small beach, but it is not advisable to swim there. If you take off your shoes and paddle your feet you will feel the cold but the gentle waters of the lake. Ross Castle was built as the ancestral mansion of the clan O'Donoghue, although more recently the palace was associated with the Brownes family by the killarney people which had recently taken Ross. The original building along the lakes was built in 1400 by the clan O'Donoghue and in 1580 then passes into the hands of Mac Carty Mor. During those centuries Ross Castle repeatedly suffered invasions. Even today, there are scary stories about this - some believe that they can see ghost ships on the sea, and it is claimed that Ross today is inhabited by the spirit of its former owner. 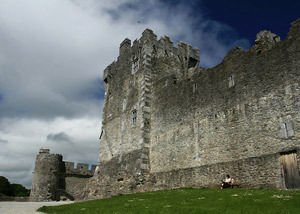 Today Ross Castle is a typical example of the names that have stood wealthy Irish families in the years of the Middle Ages. It is the type of tower house, as was originally surrounded by a moat and defensive wall with watchtowers at each corner. There is a legend which says that the owner of Ross, O'Donoghue jumped from the upper windows of the castle straight into the waters of the lake, along with his horse. The story continues, as some today believe that the owner of the castle lives in the castle at the bottom of the lake and closely monitors everything that happens in the mansion which was built in the 15th century.